Attorneys for the family of Michael Brown, the black teenager who was shot and killed by a police officer in Ferguson, Missouri, last week, discuss preliminary forensic findings. According to an independent autopsy report released Sunday, Michael Brown, the unarmed teen who was killed by a police officer in Ferguson, Missouri, last week, was shot at least six times, twice in the head. Attorneys for Brown’s family and the forensic scientists who conducted the autopsy spoke about their preliminary findings in a press conference Monday morning at the Greater St. Mark Missionary Baptist Church in St. Louis. Dr. Michael Baden, the medical examiner who conducted the autopsy, said that there were no signs of a struggle. But, he said, evaluation of the police officer who shot Brown is also needed. 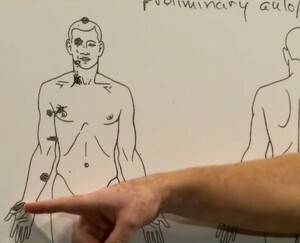 Shawn Parcells, who assisted Baden, added that the angle of the two gunshot wounds to the head indicate that Brown was bending over when those shots occurred. According to Baden, Brown could have survived all of the gunshots wounds, except for one of the shots that entered at the top of Brown’s head.